Professional advice and resources for nuisance skunk problems. In short, the best way to get rid of skunks is via live trapping and removal. You can also install exclusion barriers to keep them from going under your shed, deck, porch, etc. There is no effective skunk repellent spray or powder or device. Luckily, it's not hard to trap them without them spraying you. Read the below for more in-detail tips to get rid of skunks. omnivores, and will feed on almost anything, including small rodents, worms, insects, grubs, carrion, fruit, garbage, and pet food left outdoors. After you read the below information, in the event that you wish to hire a skunk removal company, you may want to see how much does skunk removal cost? 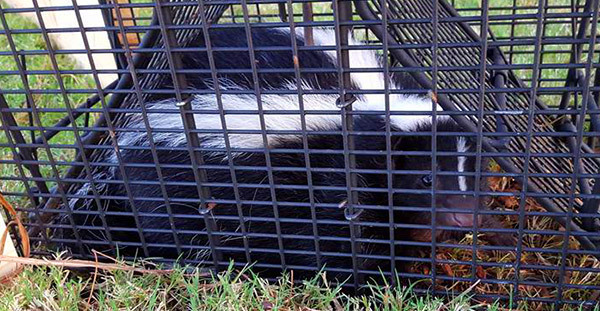 Nuisance concerns: Skunks are well known for their strong odor. People can often detect a single roadkilled skunk for miles. No homeowner appreciates this scent under their deck. Furthermore, a skunk in the area poses a constant threat to nosey pets. I've cleaned dogs that have been sprayed before, and believe me, the scent does not come off easily. Of course, no person wants to risk being sprayed by a startled skunk. Skunks frequently choose to live under human structures such as sheds, decks, or crawl spaces. They often discharge their scent in these places. Skunks are also common carriers of rabies. How To Get Rid of Skunks: The two most important things you can do are trapping and removal and prevention via exclusion barriers. If a skunk has taken up residence under your shed or porch or deck, you'll need to trap and remove and relocate the animals. Use a larger trap, raccoon size. Read here for skunk trapping tips including trap types and bait. Be sure to relocate the skunks at least ten miles away! If you don't want to have the problem again, you should take preventative measures, such as building an exclusion barrier around the shed or porch. This is basically a steel screen or any barrier that prevents the animals from going under there again. I've mostly used half-inch steel mesh buried into the ground at the base, but you can use decorative lattice if you wish, or even build a stone or brick wall. What if a skunk has fallen down a basement window well? You have two options: You can either hire a professional to remove the animal, likely via use of a snare pole, or you can place a wood plank down the well, and hope that the skunk can climb up and out. If you have a skunk in the attic, or a skunk in the wall, it can be removed via either trapping or by cutting a hole in the wall, but these scenarios are rare. It's far more common to find a skunk under the house than inside any part of the structure. We know how to get rid of skunks that there is no magic spray or device that you can use to make them go away (though their spray might make you go away). Some people try to sell predator urine, such as coyote or fox urine to get rid of skunks, but that doesn't work. They also try to sell ultrasonic sound emitters. These devices are worthless at eliminating skunks. Some old wives' tales recommend the use of mothballs or ammonia-soaked rags to make them leave, but I've been to countless homes where these techniques failed - biologists know that these attempts won't work. Read about skunk repellent products. The ONE AND ONLY WAY to take care of your problem is with trapping and removal of the animals. If you need to find a professional trapper in your hometown, just click our comprehensive list of hundreds of wildlife removal professionals, and you can have your problem quickly taken care of! Here are some of the cities that we service: - Phoenix Critter Removal - San Jose Critter Removal - Sacramento Critter Removal - Denver Critter Removal - Orlando Critter Removal - Miami Critter Removal - Jacksonville Critter Removal - Atlanta Critter Removal - Chicago Critter Removal - Indianapolis Critter Removal - Baltimore Critter Removal - Charlotte Critter Removal - Portland Critter Removal - Philadelphia Critter Removal - Pittsburgh Critter Removal - Houston Critter Removal - Seattle Critter Removal that will get rid of skunks. When you worked hard to grow a lovely vegetable garden, the last thing you want to see in that garden is a skunk. A garden provides a ready food source for skunks. So long as they have access to that food, you can be assured that they will not leave until your garden is destroyed. The problem and the solution may be that they will eat not only your roots and the grubs that live around them. Skunks eat anything. They just like to get their meals the easy way. So, one way of getting rid of them may be poisonous pellets, but poisoning is not what most people would want to do. To stop skunks from being in your garden, a more humane effort would be to place chicken wire around the perimeter of your garden plot as well as your compost pile, if you have one. You can also try to find their den and throw a couple of handfuls of moth balls into it but this will only make the skunk move to another hole. This can also be complicated by the need to make sure the den is empty. You don�t want to disturb a nursing skunk mom. She will make you sorry by spraying you. The best way to get rid of a skunk is to buy a live trap, trap the animal and remove it to a far-away site. This can be quite tricky for obvious reasons. To remove skunks from your yard is a pretty big job. Your yard may be quite large with many opportunities for skunks to set up housekeeping. First you must find out where they live. If you see them disappear under a shed or porch, or even under a woodpile next to a shed, then you have probably found their den. You can�t just approach this den and poke into it with a stick trying to get them out. For one thing, that could be very dangerous if a skunk mom is protecting her babies. Secondly, a skunk is wildlife and with any wildlife, you need to think about rabies and other bacterial or viral diseases. So be careful how you go about getting rid of them. Buying a live trap is probably the best way to move them out of your yard. Disguising the trap with leaves and sticks, placing an incentive inside, such as dog food or something perhaps coated with peanut butter, may get your skunk trapped. Once you have the skunk in the trap, make sure there aren�t any babies left in the den. If there are, they need to be trapped also. Then take the entire family a few miles away from your home and set them free. Once you have deposited your animal elsewhere, make sure your yard does not pose as an attraction to wildlife any longer. Can you imagine getting ready for work one morning, opening the garage door and getting hit with a whiff of skunk! That would be a pretty serious eye opener. First you may want to see if the offending critter is anywhere in sight, especially if his backside is facing you. If that is affirmative, then run! One way to get rid of a skunk in your garage is to wait until it is gone and then close the garage door. You can also spray pepper spray at the bottom of the garage door so that the skunk will be reluctant to try to enter again. Some garage doors are not functioning correctly and there are gaps between the door and the ground where the skunks can squeeze their way inside. There may be a hole along you wall somewhere in your garage that serves as an entrance. In these cases, closing the garage door won�t matter. However the skunks got in, the fact is that it has to leave. If you know where in your garage they like to stay, place moth balls in that spot. They don�t do as much good as is reported, but they may get the skunks out long enough for you to take more effective measures. Spraying pepper at the skunks� entrance may stop them from entering again. This has to be done maybe daily, or at least several times a week. Trapping it in a live trap is another option. Sheds are ideal places, from the skunk�s perspective, to live. A shed is relatively quiet most of the time and it provides shelter from elements and predators. They can mate and raise babies there, undisturbed. When you notice that you have squatters in your shed, they may be living there already in multiples. You need to get them out for health reasons as well as because of the fact they are just plain nuisances. Some people advocate bright lights as a repellant. Since skunks forage at night, they are not too fond of bright lights. This may be a bit hard to do in a shed since you have to get in there in order to set up the lights. The skunks are inside and so far as they are concerned, you are invading THEIR home. You won�t get a warm welcome. While lights may work, they are not a good option in a shed unless you know they are all gone before you bring in the lights. You can sprinkle chalk dust, corn starch or flour on the ground at the portal they use to get in and out of the shed. After dark, check if you see tracks leading away from the shed and therefore safe to enter. Pepper sprays, repeatedly applied, will also chase them out of your shed. Once they are gone, close up any openings and create a barrier of chicken wire around the bottom of the shed. Ultimately, I recommend trapping and removal of the skunks. They can be relocated, or you can kill skunks if that's the regulation in your state due to rabies. If you don't want to trap, and they are living under a structure, you can also attempt exclusion. Should I Feed A Baby Skunk That I Found? What Is A Skunk's Natural Diet And How Does It Get Its Food? What To Do If A Skunk Gets Into A House, Bedroom Or Kitchen? Should I Hire A Professional Or Remove Skunks Myself? What Is A Skunk�s Natural Diet? Can a skunk climb a fence? What is a skunk's typical diet? Can a skunk spray more than once at a time?